At Mission Oak High School, education and inspiration does not only take place inside the classroom; we believe that another important aspect of student life is being involved in clubs and activities. Our extracurricular programs, led by enthusiastic instructors, allow students the opportunity to interact with their peers who share similar interests. For more information about the various clubs not included on this page, please contact us. If your child is interested in becoming involved in a student sport, please visit our Athletics page. 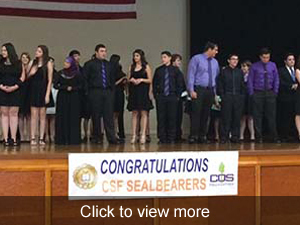 CSF is the oldest honor society in California, founded in 1921. Mission Oak’s chapter is the 1,394th chapter in California. To join, you must have top grades in top classes. Your grades convert to points, and you must earn ten points per semester to be eligible for CSF. Four semesters of eligibility earns you lifetime status at graduation. You sit in front, wear a gold cord, get a certificate, and have CSF on your transcripts. Freshman year, you are an honorary member of CSF, meaning you are in the club, but these semesters do not count toward graduation status. CSF is fun! We do activities such as the senior luau, babysitting, letters from Santa, and Jamba Juice. It is a chance to give back by using your brains for philanthropy. At the start of each semester, check the gold eligibility list with your English teacher. If you are on it, bring $3.00 to Mrs. Jones or the membership table in the cafeteria to buy your application. Fill out the application, return it to Mrs. Jones, and you are in the club for the semester. You must reapply each semester as we base membership on the previous semester’s final grades. Visit the FFA website for more information about our district FFA program. We promote the good news happening at MO through our website, YouTube channel, e-magazine and social media. Though we also meet as a class, the club is also open to student volunteers on a case-by-case basis. "We do what others fear more than death!" MO Forensics is a club that celebrates the art of public speaking and power of the human voice. This club supports our Speech Communications courses, but is open to everyone at Mission Oak, whether you are enrolled in Speech class or not! We compete in speech competitions such as Lion's Club, Rotary, Poetry Out Loud, and even our very own Mission Oak graduation speech spots. We also produce the popular Writers' Cafe right here at Mission Oak, which is our very own cool coffee house complete with music, cupcakes, and caffeine! Mock Trial is a highly competitive and highly fun club in which team members, chosen through an audition process, prepare a case based on presented facts to be argued against other local high schools in the legal environment of the courtroom. Team members learn public speaking, legal skills, presentation skills, and acting skills. Additionally, they also get the chance to work with local attorneys in preparing the case. Yearbook is dedicated to chronicling the events, groups, and students that make each year at Mission Oak unique. The student-run staff take pictures, interview students, write blurbs and captions, and organize all of their work in a layout that is both pleasing and understandable. The end result, a book that tells the story of Mission Oak High School in a given year, is a treasured keepsake and an iconic piece of American culture that lives on forever. Interact is a community service club connected with Rotary International. We participate in both local and international projects each year. Key Club is a community service club connected to Kiwanis Service Leadership program. Our club allows students to be involved in their local community. Link Crew is comprised of upper classmen who mentor freshmen academically and socially. The goal is to help freshmen feel at home and part of a family throughout their first year here and beyond. The S Club is sponsored by our local Soroptomist organization. The "S" stands for Soroptomist, "A global women's organization whose members work to improve the lives of women and girls through programs lending to social and economic empowerment." The Soroptomist and S Club promote the quality of life for all women and highlight various issues such as sexual assault and human trafficking. Book Club members meet at least monthly to discuss book selections. We often read the same book together, but sometimes we choose our favorites and share them with the group. We also try to read books from different genres to experience many different stories. Christians on Campus is a student-run club, lead by students of the Christian faith that welcome students of every faith background. Join us for fellowship, prayer, and a place to meet new friends! A GSA club is a student-run club that brings together LGBT+ and straight students to support each other, provide a safe place to socialize, and create a platform to fight for racial, gender, LGBT+, and economic justice. 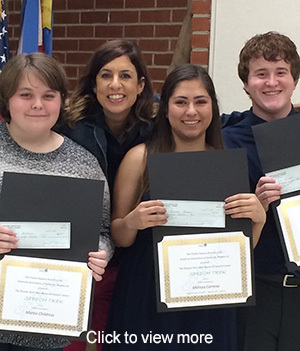 Mission Oak High School drama students work as a team to create live theater. Make sure to follow us on Facebook and Instagram. We typically meet every other Thursday. We aim to support, praise, and build pride within all Mission Oak sophomores. We focus on fundraising and planning prom. Seniors meet to discuss senior activities such as t-shirts, winter formal, senior breakfast, grad night, senior sunrise and sunset. Do you have a question regarding MOHS student activities? Contact our activities director!